Thanks to Tony Durano for once again sponsoring Heather’s Ride! Tony is a State Farm Insurance Agent in Andover and an avid cyclist. We appreciate your support! Erin Duncan, with SPIN ICT, is sponsoring, donating for our goodie bags, and riding 50 miles! Way to go SPIN ICT! 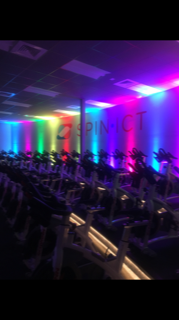 If you want to try out SPIN ICT, the business is located at 8641 W. 13th Street. That's the corner of 13th and Tyler in Wichita. Thanks to Dr. Jennifer Burgoyne from ICT EYE, LLC for sponsoring Heather's Ride. Dr. Jennifer is riding the 50 mile route this year, sponsoring the ride, and even donated stress relief balls for our goodie bags! Our sponsors are the best!